Auroa was inspired 1920’s silhouettes – free, flowing, and innately feminine. Wear this design over a floral dress or romantic tank for maximum effect. 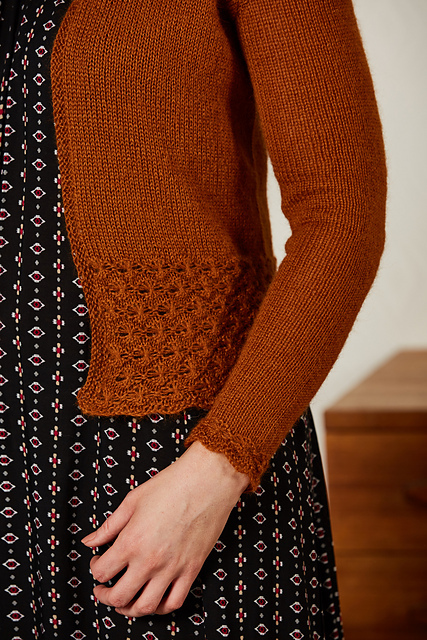 Auroa is worked flat in pieces, and seamed at the completion of all knitting to make the lace treatment easier to manage. The lace treatment is a daisy stitch with a minimal background of St st so that the daisy motif pops out a bit more. After several inches of the daisy stitch are worked transition into Stockinette stitch and begin the slight v-neck shaping. With the transition from the lace stitch to stockinette stitch, the design achieves a subtle a-line shape that is flattering to most body types and ultra-feminine to boot. The armholes are shaped for set-in sleeves. The sleeves begin with a small repeat of the daisy lace stitch, and then worked in Stockinette st to the sleeve cap. Once the pieces have been blocked and seamed, sts are picked up around the neck opening and worked in garter to create a neat trim to the piece.